Educate yourself DVD, How to care for a pet bird, and understand what it takes to be a responsible, caring parrot owner. 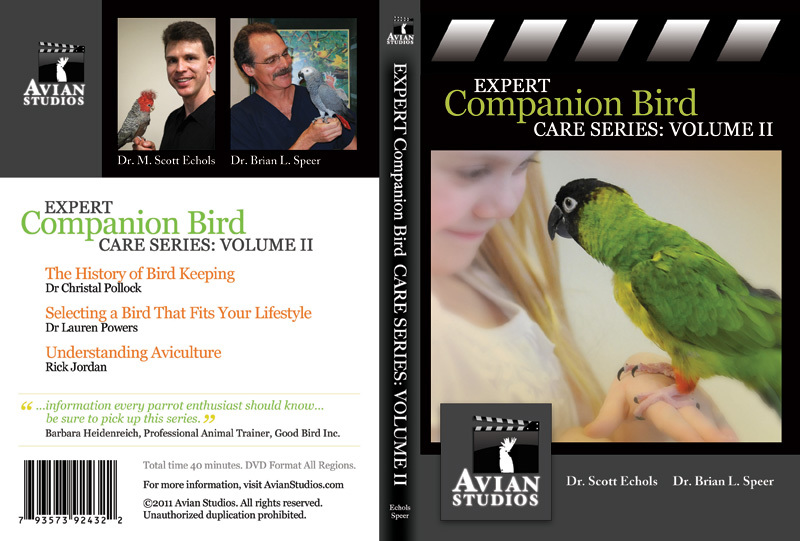 Volume I, (AS75516), of the expert companion Bird Care Series is the first volume in a comprehensive DVD series created by recognized avian veterinarians, teachers, aviculturists, enthusiasts and pet store owners. Drs Scott Echols (author of Captive Foraging) and Brian Speer (author of Birds For Dummies and The Large Macaws) work with world renown avian educators to bring you the best information on bird care. 1. How to Identify Commonly Kept Parrot Species-Jeleen Briscoe VMD Dipl ABVP Avian. Laura Wade DVM Dipl ABVP Avian. Paul Gibbons DVM Dipl ABVP Avian. Volume II, (AS92432), of the Expert Companion Bird Care Series centers on the history of keeping birds, selecting birds that fit the lifestyles of their owners, and aviculture. We conceived of the series as a reliable resource on avian care that veterinarians, pet stores and websites can offer to their bird-owning clients. 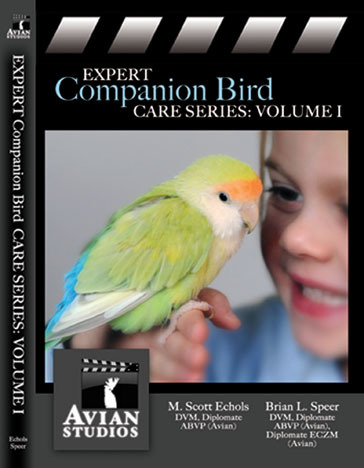 The Expert Companion Bird Care Series presents comprehensive bird care information from several world-class avian veterinarians, teachers, aviculturists, enthusiasts and pet store owners.